Vevida Review 2019: Is Vevida a Good Hosting? Vevida has been providing hosting in The Netherlands and Belgium since 1999. Its pricier plans offer few value-adding extras for the money, but the more reasonably-priced plans have useful features for WordPress websites and security. Vevida is a long-standing company that has been providing hosting services since 1999. Based in the Netherlands and Belgium, it currently has more than 50,000 customers. The Vevida website is available in Dutch and English. Vevida owns its servers, but they are colocated in two data centers (TCN and NLDC) both in Groningen, Netherlands. Although it’s always better if a company owns its data center, at least Vevida uses its own team to monitor and manage its servers 24/7. 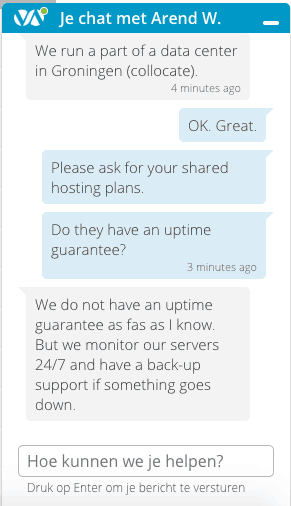 As confirmed via live chat, there is no uptime guarantee and no service level agreement. The servers are Supermicro, HP and Dell, with Intel Xeon processors and SSD for data read/write speeds up to ten times faster than traditional HDD. Customers can choose between Windows or Linux operating systems unless you want a WordPress plan which will always be Linux. There are three types of shared hosting plan – Secure, WordPress, and Premium – with the features varying slightly and the resources increasing in line with the package price. The WordPress plan comes with all the same features as the Secure plan, but – as you would expect – it supports WordPress. This means you get WordPress pre-installed, all of the plugins and updates managed for you, and the direct contact number of a WordPress expert. The Premium plan includes everything that the Secure plan does, plus “website tools” which (as confirmed via live chat) basically boils down to a one-click installer for WordPress and Joomla! You can also install MediaWiki. There is not a huge number of features over and above the Secure plan, so I am not convinced of the value add here. Whilst it’s not advertised on the product pages, the plans support all versions of PHP up to the latest version. Vevida’s plans are priced higher than many international competitors but are only a little more expensive than local Dutch companies. The good news is that you don’t pay any extra for a domain and an SSL certificate. There are lots of paid add-ons available, which can increase the monthly price substantially. For example, you can add additional resources such as bandwidth or disk space, or a Microsoft SQL database that will more than double the monthly fee. Customer service is available during extended business hours on Mondays through Fridays via email, live chat and local Belgian and Netherlands phone numbers, and you can expect a response within 24 hours. I’ve got to be honest; for such a premium priced product, I’d expect 24/7 support or at least weekend cover. Wondering how Vevida stacks up against other Web Hosting companies? Enter any other Web Hosting company and we will give you a side-by-side comparison.